It’s the time of year when the smell of coconut sunscreen perfumes the air, pants and shirts are replaced with tank tops and shorts, kids linger on the streets long after twilight, and people fall to the charms of a red sun sinking beyond the water’s edge. Everything slows, allowing us to hear the drone of bees pollinating the flowers, and the tender chirrups of tiny birds in the underbrush. The midday heat is tempered by bursts of saltwater breezes sweeping off the ocean, cooling the landscape with its briny touch. For weeks I watched the skies twirl through bouts of thunder and lightning, two seasons battling it out like tectonic plates waiting for one to overtake the other, until the first signs of summer silently slipped in, settling into the fleeting six to eight weeks coveted by our damp west coast. The wild beginning to our tardy summer finally burned through the unrelenting cloud cover, chasing away the RA blues, burgeoning into sapphire skies and sultry summer evenings. After weeks of RA fighting it out with the bouncing barometer, my disease and the weather have settled into a diplomatic agreement, allowing me to enjoy a hiatus from RA. The gentle heat smothers my morning stiffness, making it easier for me to move and offering a dose of effervescent vitality. It is a good time to take advantage of extra walks around the sea wall, swimming, weekly dance classes, and yoga in the cool of the morning. I don’t discount that a medication adjustment may also be at play, eliminating the bulk of symptoms, and leading me into more productive days. The arrival of summer also restored a fervent desire to return to a proper diet. Months of performance and rehearsals often resulted in late night quickies of popcorn and the occasional bourbon – a far cry from the nutritional superfoods required to fight inflammation and support a compromised immune system. A food challenge on social media has taken me back to cooking real food, eliminating the apathetic convenience of processed fare and along with the change in weather, I am reaping the results with less bloating and more energy. These are the perilous days when I forget. I forget that yesterday RA knocked me on my proverbial bottom; I forget that only weeks ago, RA burned through my blood, pushing my inflammation markers well above average; I forget that fatigue and pain crippled my efficiency for daily tasks. The memory of that pain still lingers like a phantom in the deep recesses of my joints, occasionally resurfacing in my knee, a potent reminder not to push too hard, no matter how good I might be feeling. It’s a deceptive time when RA takes a hiatus – one never really knows how long it will last and experience has proven that it can return as quickly as a flash of lightning in a summer storm. 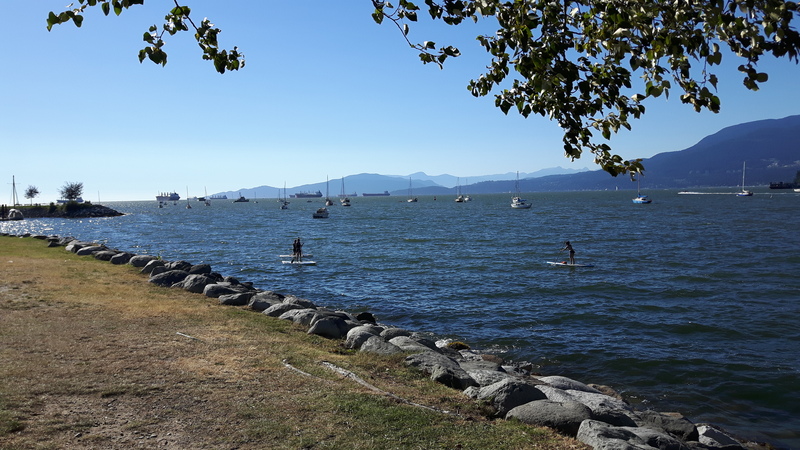 The summertime blues are gone for the moment – I can get out and enjoy the picturesque beauty of our coastal city, I have energy to visit with friends and family, and I am back on track with wholesome food and daily walks. On cool summer evenings, I watch the lanky tree tops sway fiercely in the salt water breeze reminding me to be mindful of the rapid shift that can occur. Tomorrow the clouds may roll in and so might RA – but today I am grateful for the reprieve I have been given. Thank you Wren. I love these sunny days here on the PNW. Last year we had an unusual dry bout of weather, this year back to cooler wetter temperatures, something I know you like 😉 Hoping your hands aren’t giving you too much trouble these days. X.
I always, always love your posts. Unfortunately, I’m reading this while its 101 degrees Fahrenheit here in Dallas. LOL! I’m wishing for cooler fall weather and you’re celebrating your summer! Wow. Hoping you’re staying cool. Our summers don’t stick around long so we try to take advantage. I’ll send some of our cooler weather your way :). Hoping all is well with you. X.